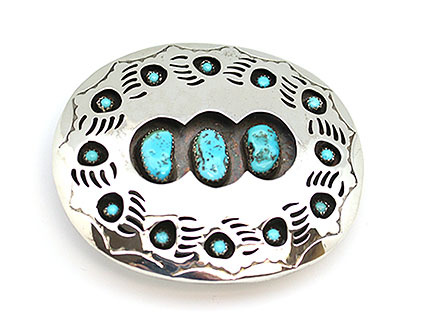 This sterling silver shadow box bear paw belt buckle has 3 free form turquoise stones in the center with 12 bear paws along the edge. Each bear paw has a 3mm turquoise stone. Belt buckle measures approximately 3" by 2 1/2" and has a 1 1/2" long buckle back. Handmade by Navajo artisan Pearlene Talley. Size and shape of center stones will vary.